New Rochelle, NY, September 25, 2018–Researchers have performed a comprehensive review of the current state and future potential of using biologic medications to treat asthma in children. They evaluated a broad scope of approved biologics, the available information for each, and whether predictive or monitoring biomarkers are available for each biologic drug, presenting that information in an article published in Pediatric Allergy, Immunology, and Pulmonology, a peer-reviewed journal from Mary Ann Liebert, Inc., publishers. Click here to read the full-text open access article on the Pediatric Allergy, Immunology, and Pulmonology website. In the article entitled "Current State and Future of Biologic Therapies in the Treatment of Asthma in Children," Elissa Abrams, MD and Allan Becker MD, University of Manitoba, and Stanley Szefler, MD, University of Colorado School of Medicine and Children's Hospital Colorado, state that more personalized approaches to asthma therapy in children are opening the door to biologic therapies and in particular those targeting the "allergic," T-helper (2) pathway. The researchers reviewed at least a dozen biologics, including the anti-IgE medications Omalizumab and Ligelizumab, the anti-IL-5 medications Mepolizumab, Reslizumab, and Benralizumab, and anti-IL4 and anti-IL3 medications. Future goals focus on using these biologic therapies to decrease the burden of asthma severity in children and moving toward disease modification and prevention strategies that can prevent and even improve pulmonary function through the reversal of airway remodeling. "While severe asthma comprises only a small portion of patients with asthma, it poses a significant burden on the healthcare system with high resource utilization and direct costs. As more is learned about asthma phenotypes, there has been increasing interest in the use of biologic therapies in children with moderate to severe asthma," says Pediatric Allergy, Immunology, and Pulmonology Editor-in-Chief Mary Cataletto, MD, Professor of Clinical Pediatrics, Stony Brook University School of Medicine. "The article by Abrams et al. focuses on the development, use, and potential future of biologics in this select group of children and explores biomarkers that may be helpful in selecting and monitoring appropriate candidates for treatment." 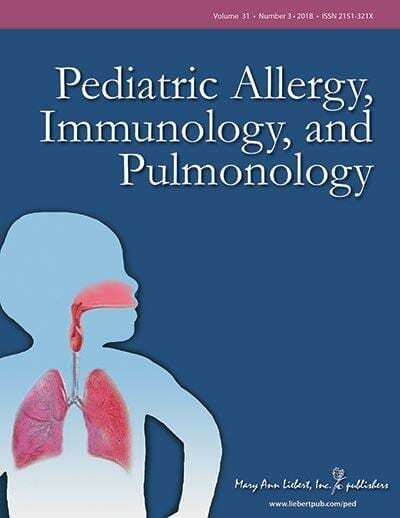 Pediatric Allergy, Immunology, and Pulmonology is a quarterly, peer-reviewed journal published online with open access options and in print that synthesizes the pulmonary, allergy, and immunology communities in the advancement of the respiratory health of children. Led by Editor-in-Chief Mary Cataletto, MD, Professor of Clinical Pediatrics, State University of New York at Stony Brook, the Journal provides comprehensive coverage to further the understanding and optimize the treatment of some of the most common and costly chronic illnesses in children. It includes original translational, clinical, and epidemiologic research; public health, quality improvement, and case control studies; patient education research; and the latest research and standards of care for functional and genetic immune deficiencies and interstitial lung diseases. Tables of content and a sample issue may be viewed on the Pediatric Allergy, Immunology, and Pulmonology website. Mary Ann Liebert, Inc., publishers is a privately held, fully integrated media company known for establishing authoritative peer-reviewed journals in many promising areas of science and biomedical research, including Journal of Aerosol Medicine and Pulmonary Drug Delivery, Breastfeeding Medicine, and Population Health Management. Its biotechnology trade magazine, GEN (Genetic Engineering & Biotechnology News), was the first in its field and is today the industry's most widely read publication worldwide. A complete list of the firm's 80 journals, books, and newsmagazines is available on the Mary Ann Liebert, Inc., publisher's website.